History has shown that one enthusiastic motorcyclist can eventually inspire dozens, even hundreds, of others to take up the sport. That is especially true when a keen rider can look back on a lifetime of more than 100 years himself. 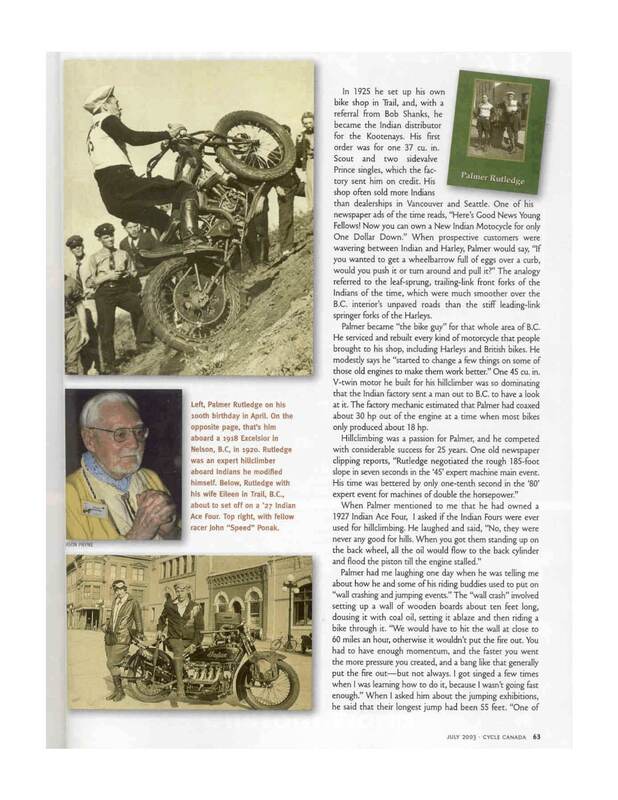 Such was the experience of the late Palmer Rutledge, who bought his first motorcycle at the age of 12 and went on to become “the bike guy” of much of the B.C. Interior. Palmer was born in Goderich, Ontario in 1903 and seven years later his family moved west, eventually settling in Nelson, B.C. There, in 1915, he bought a five-year-old Reading Standard whose previous owner found it too feeble to climb the hills he needed to cross to get to to work in the next town. Palmer learned his mechanical skills largely by himself, since there was only one other motorcycle in the vicinity. The little Reading Standard belt-drive single eventually gave way to a full-size machine, a 1918 Excelsior V-twin. When he was 19 Palmer moved to Victoria to study art, and there he discovered the Indian motorcycle dealership run by Bob Shanks. Bob’s brother Reg operated the Harley-Davidson dealership next door, but Palmer favoured the Indian brand and eventually bought a 37 cubic inch Scout from Bob. His relationship with Indian was a lasting one and in 1925, with help through a referral from Bob Shanks, Palmer became the Indian distributor for the Kootenay region. He was still only 22 years old but the factory shipped him his first order of three bikes on credit. He advertised new Indians for only one dollar down payment and went on to often sell more new machines than dealers in major cities like Vancouver and Seattle. Palmer’s mechanical skills were considerable and his shop provided service for whatever kind of motorcycle came in the door, whether Indian, Harley, other American make or British. He also showed a knack for making them go better, and became a devotee of hillclimb competition for 25 years. His success prompted the Indian factory to send a representative to examine the modifications to his Scout that had nearly doubled its horsepower. Palmer raced in B.C. and in Washington state and became friendly with his rival on Harley-Davidson, Trev Deeley. When stopping in Vancouver he would work on his Indian in Deeley’s shop and he even sold a few Harleys for Trevor if his own customers insisted on them. Palmer and his buddies enjoyed the carnival act of smashing their bikes through a wall of burning wooden planks soaked in coal oil. “You would have to hit the wall at close to 60 miles an hour, otherwise it wouldn’t put the fire out,” he said. He recalled getting singed while learning the trick when his speed was too low. Jumps were another favourite diversion, and one of Palmer’s pals had a docile horse that could be persuaded to lie down behind a wooden launching ramp so Palmer and his friends could jump over it. He recalls their best flight was 55 feet, not bad on the heavy machines of the day with no rear suspension and little at the front. Tough times in the motorcycle business are nothing new and Palmer didn’t sell a single bike in 1933 at the depth of the Depression, but he did keep the doors open through service work and sales picked up in 1934. 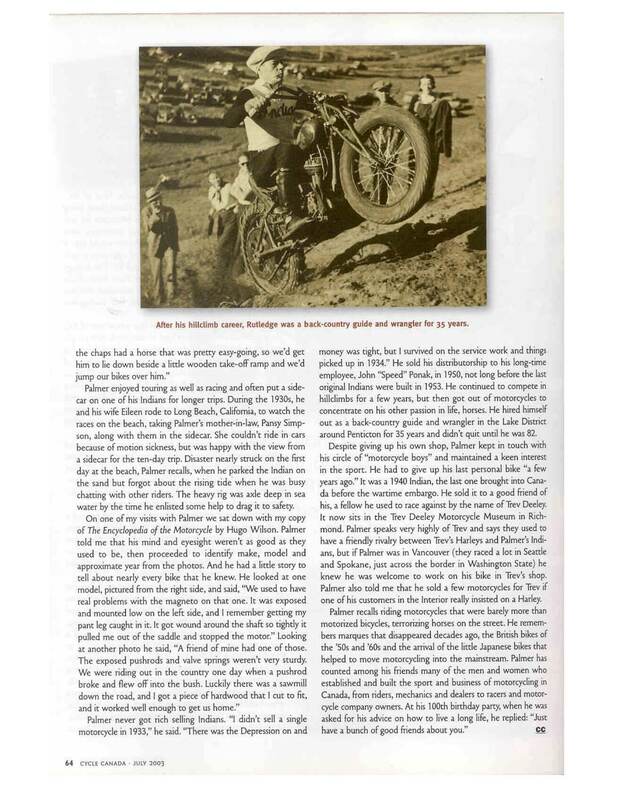 Palmer hitched a sidecar to his Indian for touring, and embarked on a 10-day tour of the western states with his wife Eileen on the pillion and her mother in the sidecar. Eileen’s mother couldn’t ride in a car because of motion sickness but had no trouble in the sidecar. 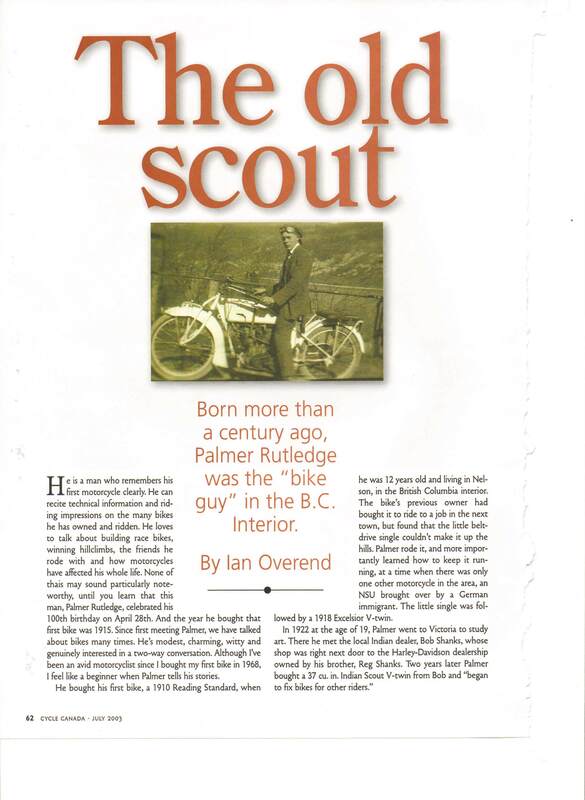 Palmer’s last personal bike was a 1940 Indian that was the last one brought into Canada before a wartime embargo was imposed on civilian sales. He sold his Indian agency to long-time employee John “Speed” Ponak in 1950, just three years before the factory closed. Palmer’s other passion was horses, and after selling the business he worked as a back-country guide around Penticton for 35 years, until he was 82. He made his home in Vancouver and was a popular member of the Southlands Riding Club for many years. Still with keen recollections of his long motorcycling career, he died in 2005 at the age of 102. Palmer Rutledge passed away in 2005.